Wouter Stellaard, animal programs training director at the Columbus Zoo and Aquarium, presents “Zoo Animal Behavior and Training” from 5:30–6:30 p.m. Thursday, Jan. 24, in the Animal Sciences Arena in the Animal Science Building on Ohio State’s Columbus campus. Admission is free and open to the public. 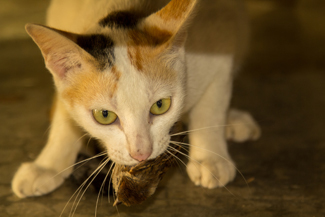 The host is the Human-Animal Interactions Club, which is the undergraduate student arm of our college’s Center for Human-Animal Interactions Research and Education (or CHAIRE). See demonstrations by Ohio’s first-ever wildlife K-9 program in the Gwynne Conservation Area at CFAES’s upcoming Farm Science Review. The dogs in the program are trained to sniff out poached wildlife, fish and ginseng, and gun powder and lost hunters, too. Their handlers are wildlife officers with the Ohio Department of Natural Resources’ Division of Wildlife, which started the program this year. Tuesday, Sept. 18, 10:30-11 a.m., 1:30-2 p.m. Farm Science Review overall is Sept. 18-20. More Gwynne activities. Conservation biologist Pete Marra, author of Cat Wars: The Devastating Consequences of a Cuddly Killer (2016, Princeton University Press), speaks twice at Ohio State next week: at the Tuesday, Nov. 7, breakfast program by the Environmental Professionals Network (EPN), and at the Wednesday, Nov. 8, annual conference of the Ohio Community Wildlife Cooperative. 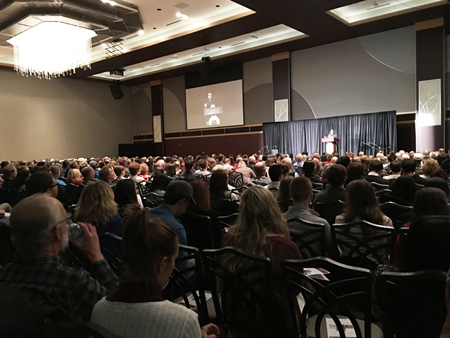 CFAES’s Molly Bean shared this shot of the full house — 1,000-plus people in the Ohio Union in Columbus — at Monday’s night “Grizzly Bear 399” presentation. Thanks, Molly! Ris Twigg reported on “An Evening with Grizzly Bear 399,” Monday night’s full-house presentation by Todd Wilkinson and Thomas Mangelson, hosted by the Environmental Professionals Network, in Ohio State’s student newspaper The Lantern. Grizzly Bear 399, who will be featured in Oct. 24’s Environmental Professionals Network event at Ohio State, has a Twitter feed. Only about 250 seats remain out of the original 1,000 available for “An Evening with Grizzly Bear 399” on Oct. 24 at Ohio State. So says CFAES’s David Hanselmann, coordinator of the Environmental Professionals Network, which is hosting the event. Read more here. Register here. An Oct. 24 event at Ohio State will feature Grizzly 399, who lives in (and tweets from) Grand Teton National Park. Learn more about her in the video above.